Greenhouse Ventilation Systems are an important part of the entire greenhouse. Without them, heat will build up quickly on sunny days. The greenhouse ventilation systems consist of an appropriately sized exhaust fan, 1 or 2 intake shutters and a thermostat. The sizes needed are determined by the square footage of your greenhouse. Don’t have electricity? Check out our Solar Powered Vent at the bottom of the page.Scroll all the way to the bottom for our solar powered exhaust fans. We suggest you place the exhaust fan up high in one end of the greenhouse. Place the shutter(s) down low on the opposite wall. Wire them to a one stage thermostat or two stage thermostat. This will enable your greenhouse ventilation system to give you the most efficient flow of air throughout the entire greenhouse. 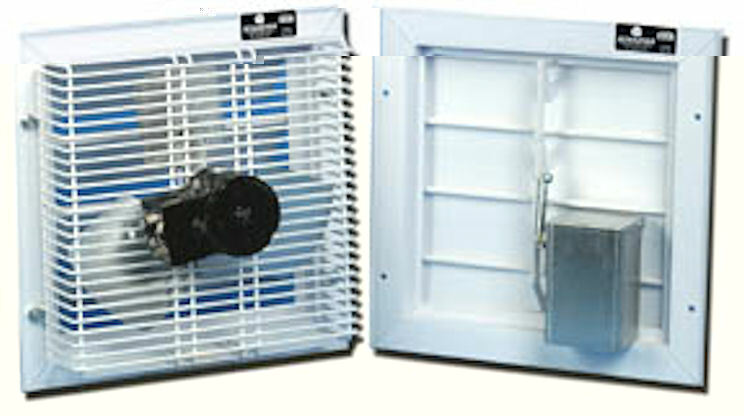 The motorized exhaust fans have an aluminum blade and pvc shutter. 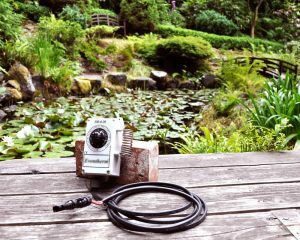 The heavy duty motors are totally enclosed and maintenance free. 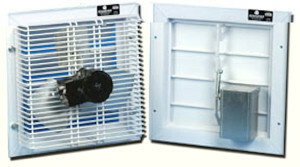 The motorized intake shutters are exterior grade PVC for a maintenance free unit. This will also resist rust and corrosion. The louvers are curved for a tight fit when closed. Corners are fused together for strength and durability. 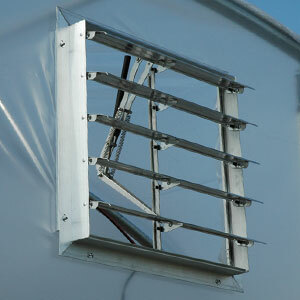 Greenhouse ventilation systems may be easily retrofitted in a polycarbonate greenhouse. But, we highly recommend purchasing them at the same time as a glass greenhouse. Do you have a greenhouse that needs ventilation where you have no electricity available? This intake shutter comes equipped with a solar powered opener. This opener is a wax cylinder that operates on the principle of contraction and expansion. When it is warm, the wax will expand and open the vent. When it is cool, it will contract and close the vent. This unit is available in 6 different sizes. The 4 smaller intake shutters may be installed directly into a polyfilm greenhouse (with no additional framing) using the wiggle wire that is included. If you prefer to mount these to a framed in opening minor modifications are required. Please let us know in customer comments how you intend to use the vent, framed or polyfilm. That way we will take care of the modifications for you. The 2 larger sizes must be mounted to a frame. The automatic openers can be adjusted so that they start opening between approximately 65 and 75 degrees F.
Have a greenhouse in a remote location? Need to ventilate it? No electricity around? Here is the solution to your problem. This solar powered exhaust fan comes appropriately sized with a thermostat and a shutter for the fan. 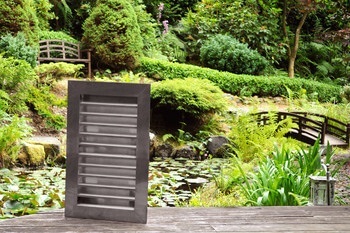 Manual louvers are available to complete this package. 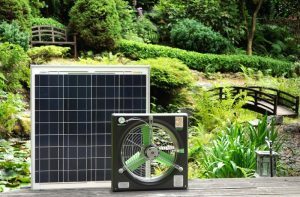 We also have solar powered circulating fans to make this a complete package. These come in 3 different sizes. 2 – 18″ x 36″ intakes, screened, galvanized or paintable bondo $728.00 including shipping to Contiguous US.